Many b2b and b2g companies assume LinkedIn is their best option for social media marketing. Market research suggests that could be a mistake. First in a series. Hiding behind these questions are assumptions, biases and prejudices about these two giant social media platforms. Assumption #1: Facebook is the “social” social network. Facebook is where you catch up on your long lost college roommate or secret heart throb. Wish your cousin happy birthday. Post pictures of your pets. Share a snarky political cartoon. There is no getting away from Facebook’s more personal, informal and “emotional” content. And we all know b2c marketing is emotional marketing and EVERYONE is on Facebook and EVERYONE is a consumer, Therefore, Facebook is for b2c marketing. Assumption #2: LinkedIn is WORK. Professional networking. Making money. We visit LinkedIn in business casual. Creating their first LinkedIn profile is a right of passage for college graduates. Users put “fact based” content on LinkedIn, and because b2b and b2g customers rely on facts to make decisions, it follows that LinkedIn is for b2b and b2g marketing. While LinkedIn and Facebook cultivate different user experiences, there is a ton – a ton – of overlap between their actual users. 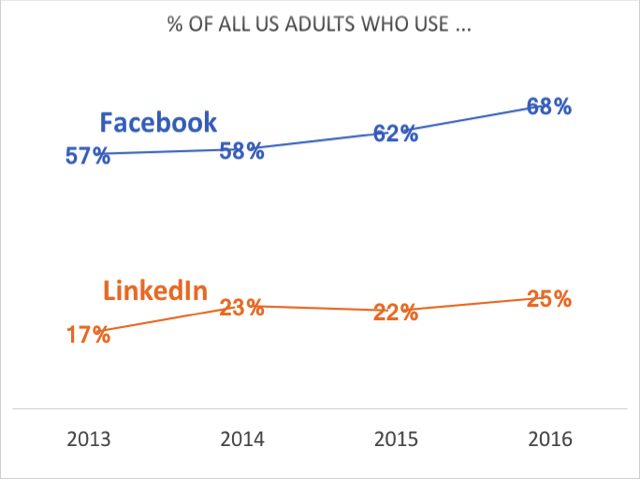 There has to be, given that more than two thirds of all US adults use Facebook (see chart above). In other words, a b2b executive on LinkedIn is still a b2b executive when she uses Facebook. But which is the best social media platform to meet her with a b2b marketing message? And other than our assumptions, is there data that answers that question? There is. Pew Research does an annual, nationwide survey of social media and provides the raw data sets to the public. AGX took a look at them, and using Tableau, created data visualizations that get at the question of which is better, LinkedIn or Facebook. In our next blog, we share our analysis. Stay tuned.